While there are many ways to use teak and holly plywood, marine applications are most common. This beautiful plywood is often used for boat interiors and cabinets, and so long as it is properly finished, marine grade teak and holly plywood can be used for boat decks and other exterior applications. As its name implies, this plywood is made with both teak and holly wood for an attractive, contrasting look. Wider bands of teak are separated with narrow bands of holly or other white wood such as ramin or white maple. It’s important to note that even when holly isn’t the white wood species used to formulate these panels, they are still called “teak and holly” plywood. When building with this type of plywood, there are some things to be aware of. First and foremost, it is not waterproof, even though it contains teak. Prevent damage by sealing all edges and faces, particularly if the wood will be exposed to water on a regular basis, such as when used in exterior marine applications including decks, transoms, hatches, cabin soles and other visible components. It should never be used for exterior features situated below a boat’s waterline. Properly protecting teak and holly plywood from the elements will help prevent rot while preserving the material’s appearance. Four coats of clear, penetrating epoxy such as Smith’s must be applied to all edges, and two coats should be applied to each face. Follow up with a minimum of ten coats of exterior varnish on edges, at least six coats on the front face, and at least two coats on the reverse. Refinish as needed to prevent damage. 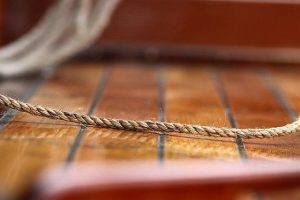 High-quality teak and holly plywood normally has a tough, lightweight marine core formulated with phenolic glue. Face veneers of at least 1 mm thick are desirable, as they stand up to wear when properly varnished. This type of plywood comes in a variety of thicknesses starting with 3 mm 3-ply, as well as in a number of different panel sizes. As you might expect, some larger suppliers that specialize in marine construction materials are likely to offer quite a bit more to choose from. 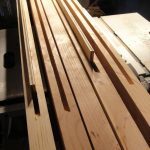 Teak and holly is more costly than most other types of plywood; expect to pay somewhere between $200 and $400 per sheet depending upon quality and other aspects. Synthetic deckings are available at a much lower price with ease of installation. You may find that some specialty hardwood suppliers are willing to offer discounts for large-quantity purchases. Although you might be tempted to leave this product unfinished as it is quite beautiful in its natural state, reconsider unless there is no chance at all that the project you’re working on will ever be exposed to moisture. Proper sealing with epoxy and several coats of varnish is labor-intensive, and it’s true that all those coats take time to dry, but meticulous work will pay off by protecting your investment while vastly improving the look of your finished product.